Utah… Sometimes you just have to say you’re sorry. With Utah’s birthday coming up, July 24th to be exact, I thought I‘d get a little jump on the topic of Utah. I have a great deal of appreciation for my state, and by state I mean Utah, the state I live and not my mental state… although the same could be said for that as well. 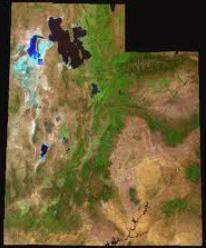 Utah is quite diverse, geographically speaking. When you begin talking about the people, a lot of the diversity is a result of visitors, and people experiencing layovers at the air port. 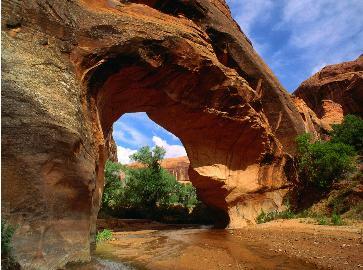 Still, when you look at the land, Utah does have some beautiful national parks, forests and mountain ranges. Some are teeming with evergreens, rushing rivers and speckled with red and orange stone, arch carved and always thirsty for water. In the northern part of the state you can always expect a nice ensemble of seasons. Apart from the raw breathtaking beauty of the state, there are also little nuggets that seem to help others appreciate the state as well. Things like snow, for those of the winter sport inclined. The Sundance Film Festival brings with it a spotlight and red carpet for Utah once a year. We even have a professional soccer team, oh yeah, and a basketball team that was relocated from New Orleans decades ago… which explains their name, because let’s face it one of the things Utah is not known for is their Jazz, well they are, just not in the Louis Armstrong sense of the word. Then there are the things about Utah that you are a little unprepared for. 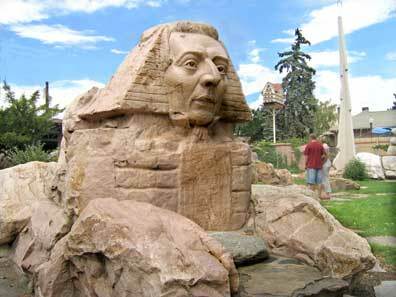 Things like the Gilgal Sculpture Garden. As a standalone name for a garden it’s rather opinion free. When you find out there is a sculpture of a Sphinx there that has the head of Joseph Smith, you begin shacking your head in much the same way you might shake up an Etch-a-Sketch when you need to start over again on your picture. Joseph Smith was the chap that created the LSD religion, the dominant religion for the state. To make a comparison, I guess you could say it would be a little like going into Vatican City and finding a garden with a sculpture of a giant Sphinx with the head of Saint Peter on it… ok so maybe there is one. I have no idea. I’ve never been to Vatican City. Still, either way it’s one of those things that strike you as a bit odd. Or there is the unhealthy obsession and addiction that mainstream Utahans seem to have with Jell-O. I have no idea where this intense connection to a wiggly green gelatinous food-like substance comes from, but there is also an unrelenting impulse to put shredded carrots in it. Then there are things that are just odd enough that you are compelled to say, “Yeah, started here in Utah, sorry about that!” A friend sent me an article this morning of one such event. The article made me want to take the time to let you know that we in Utah are sorry about this. I give you… the Candwich! A man by the name of Mark Kirkland, from Salt Lake City, Utah is going to be unleashing a product that is a sandwich in a can. I was touch disturbed when I first saw this because the first place my mind went was that it was a thick puréed liquid that was supposed to taste like the picture on the can. You can all relax a bit, I read the article to make sure. It’s a meal stored in a can. It has all the makings for a sandwich they show on the front of the can, in the can. 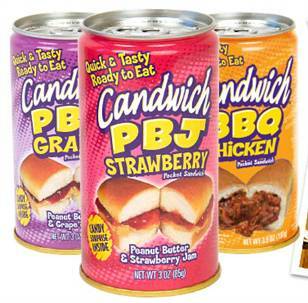 Take the strawberry PBJ one for example. The can contains a packet of peanut butter, a packet of strawberry jam, a bun in an air tight sealed bag, and a taffy treat. The peanut butter and jam ones seem harmless enough, as long as you avoid looking at all the preservatives placed in it to ensure it had a shelf life of over one year. Thus giving Twinkies a run for their money as the longest lasting food source after the apocalypse, which will probably be a result of releasing this product into the world? Let’s just hope they don’t put the word fresh anywhere on the product. There is no way a one year old sandwich is going, that is of course unless it grows a hand while in the can and get a little flirty when you set it free for your own personal consumption. The one that disturbs me and almost triggers a gag reflex in me if I think about it too much is the BBQ chicken one. Keeping BBQ chicken in a sealed bag that is stored in a can, which is not required to be chilled or refrigerated in any way and has a shelf life of one plus years… well you can call that a number of things, but I’m pretty sure chicken isn’t one of them. Even more disturbing is the thought that if it catches on you know they’ll be adding more and more flavors. I mean if it does catch on, what’s next? 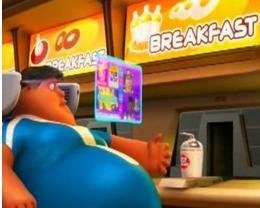 Maybe they really will start creating liquid meals for mass consumption, which only pushes us one step closer to the portrayal of humans in Pixar’s WALL-E.
What are your thought about the whole Candwich product? Google Images, key words: Utah, Joseph Smith Sphinx, Candwich, and Wall-E humans. That seemed like a long way to go for a canwich article. Anyway, can say thank you to Utah. It just wouldn’t be natual.